The word Berlin is very evocative for EM fans. And as soon as we find it on an album title, it stirs up immediately the curiosity. Normal, we think unmistakably of the Berlin School style. 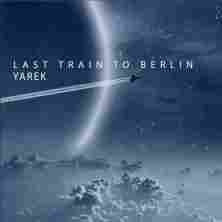 But it is necessary to be careful because certain name albums can generate a certain confusion, like this last album of Yarek; “Last Train to Berlin”. If the first rustles of "Sutra" suggest some lunar pads of synth which float as spirits of Berlin on the curves of a bass line and a soft hopping sequenced movement for get lost in some fluty Mellotrons, the rest of “Last Train to Berlin” is a beautiful collection of music pieces which are perfumed of Berlin School but which oscillate between the groove and soft techno. In fact, Jaroslaw Degorski offers a delicious mixture between vintage and contemporary with a lot of Jarre references on soft and floppy rhythms which surf at the limits of the ethereal ambiences where the synth layers to the vintages aromas lose their virginity on the kicks of sonic elements and more contemporary rhythms. This just goes to show that this last album of Jaroslaw Degorski would rather be a last stop in Berlin school than a train to go further in this style. "Monopady" plunges us straight out into a kind of e-groove with a jerked rhythm which bites of its bass line a structure pounding slowly in a sound universe soaked with voices and echoing hoops. These elements decorate continually the rhythms and removable passages of the 12 tracks of “Last Train to Berlin”. Lively and catchy, the rhythm is soft and crawls such as a big anaconda on uneven rocks while the melody weaves a pleasant earworm. 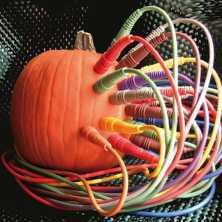 The pot of sounds is rich and amazes while giving to each track its particular cachet. "Bye, Bye Berlin" offers a similar rhythmic structure which on the other hand offers more mordant and more velocity with good sequences and good strikings of bass drum. The synth layers which hum are very near Berliner style while the melody hangs on to chirping of synths and the ambiences feed on hoarse voices. Strange is the progression of "Atlanta" which offers a structure of rhythm mislaid between its styles but among which the percussions and the trumpeting voices add an unreal dimension to what one could catalog, if need be really necessary, as a tribal psychedelic. "Europa Express" brings us in the Düsseldorf school style with a rhythm always so crawling where vocoder à la Kraftwerk and the chirpings of synths fly over a rhythm torn enter its approach of languid groove and soft synth-pop. Do I have to repeat that all this takes place in a charming sound environment? It's important cause without this element, tracks like "Orbital", "Echo", "Hokato" and "Banco", where the rhythms are broken at will, would be good copies of groups like Orbital, Future Sound of London or Leftfield. For me, "Smolensk" is the piece de resistance of “Last Train to Berlin”. The rhythm is evasive with a superb bass line which oscillates with musing, spreading an ambient rhythm which serves as pretext to lay down the only real melody of “Last Train to Berlin”. A melody of the tales from the Arabic 1001 nights forged in a synth and of its solitary singings that some chords of e-piano carry near to the door of melancholy. This is a wonderful track. "Music Play" brings us into Jean Michel Jarre's lands with a curt and incisive rhythm. But an ambivalent rhythm which oscillates between techno-dance and ambient and which pounds on stunned sequences and very edgy percussions. The portion of the Gothic choruses is simply stunning and unexpected. The title-track spreads all the opposition of rhythms and ambiences of “Last Train to Berlin”. Ambivalent, the structure hesitates between the hard and pure rhythm and its lunar moods while the harmonies are bribed by a synth which paws the ground more that sings. The 8 minutes of "Last Train to Berlin" sound like a recapitulation of the whole album where the robotics voices, vocoders, ethereal choirs and layers of synths to the aromas of Berlin School are interlace and evaporate at the whim of a structure which takes advantage of its 8 minutes to give a very good outline of the artistic duality from this last opus of Yarek. The black breaths with soft tints of oracles extricate themselves from nowhere to float as long hair in water. It's of breaths and mooing that "Movement One" gets in our ears. The musical background is of sublimity with its slow orgiastic synth pads which interlace in a ballet moved by the breaths of the void in an introduction eaten away by some hostile mooings. These orchestral pads weave an immense cosmic veil where sparkle the stars and chirp the interstellar elements. The illusion to be in a farm of aliens is metaphorically as plausible than improbable with all these quirky tones which sit under the huge tears of violins. Tears which begin waltzing against boredom, forging a dense morphic dance where the sound elements are going downhill until they get lost in the inanimate jingle of cymbals. These jingles ring and resound with uncertainty in the soporific arms of those violins sighs and lamentations of some heavy layers built in poetic tones of organs, introducing little by little the rhythm of "Movement One" which raises itself under the gallop of the percussions and which offer themselves to the sharp bites of a guitar and of its surgical solos by Jarek Figura. More than 12 minutes of morphic atmospheres, even lethal, for 2 minutes of groovy rhythm. Here is the rundown of “Discreet Charm of an Imperfect Symmetry”. 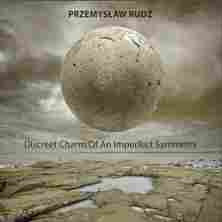 Those who know the universe of Przemyslaw Rudz' sound alchemy know that it is one of the less accessible. And “Discreet Charm of an Imperfect Symmetry” won’t change absolutely anything of it. Built on long improvisation sessions to which were grafted the partitions of Jarek Figura on guitars and Marek Matkiewicz on drums, “Discreet Charm of an Imperfect Symmetry” is an electronic improvisation in 3 movements where all the essences of the floating cosmic rock roam over structures in which the tones will nail you on your seat. "Movement Two" offers the same ambiospherical pattern with hootings of suffering machines and spectral groans which are floating among hoops which collide in a slow cosmic movement where the noise under all its forms and dimensions thrones on the ambiences. You must not have the ears virgin of heterogeneous tones because the exercise can turn out perilous. Except that we let ourselves win by a wave of heat and comfort where strata a bit orchestral sing above the waves of the Sea of Tranquillity, while that we hear some fine pulsations which, quietly, introduce a latent rhythm of which the hatching passes by a nervous movement of sequences. While the stars are sparkling, a concerto for drums and synth solos purge the tranquillity and push "Movement Two" in a heavy and furious phase of e-prog electronics where the hybrid solos of Przemyslaw Rudz tear our eardrums. Solos with twisted echoes, where are melt some heavy riffs of e-guitar, mould the most intense moment of “Discreet Charm of an Imperfect Symmetry” which collapses under harmonies murdered in the rustlings of dying metal, forcing this passionate rhythm to turn back quietly into its ambiospherical tunnel. "Movement Three" is of atmospheres with tones and electronic lamentations which shout such as cosmic whales failed on the cliffs of an interstellar ice floe. Those who like Jean Michel Jarre's ambiences on En Attendant Cousteau will be simply delighted. The more Przemyslaw Rudz moves forward in his progression, the more audacious he becomes. “Discreet Charm of an Imperfect Symmetry” is undoubtedly his most experimental work to date. But even when the synthesist-astronomer is escapes in his improvised spheres he succeeds constantly in weaving a charming sound environment where the ear has difficulty in seizing the whole of its dimensions and all of its colors. 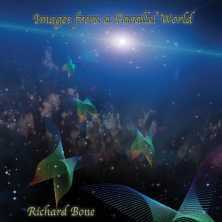 This album is for fans of sound, sound experiments, tonalities and ambiences. For others? I would recommend Paintings or still Summa Technologiae. So there will be a connection between your ears and the universe of Przemyslaw Rudz that you will tame gradually until his most crazy creative escapades find a reason to your ears. Here is one of the key albums of EM. 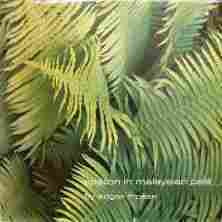 To several journalists and specialists of the 70's, “Epsilon in Malaysian Pale” is considered as a masterpiece of ambient and atmospheric music. A dominant stage in the sound exploration of the Mellotron. A little just as in Phaedra and Rubykon, “Epsilon in Malaysian Pale” is a dark album, by moments ghostly, with heavy floating movements and a slow rhythmic evolution. Inspired by his journeys in Malaysia, in the Philippines and in Australia, this Edgar Froese's 2nd solo album is in the same vein as Aqua. Froese exploits sound samplings which are of an edifying paradox. Wanting to denounce the overexploitation of these equatorial paradises, Froese makes a skillful mixture of tones from the aboriginal fauna with more industrial sounds, like trains on a railroad. It's on these rails that begins "Epsilon in Malaysian Pale". Splendid, the Mellotron floats with its austere waves which are pleasantly melted into a fluty breeze. And as on Phaedra the ambiance is dark and atonal, while that Froese plays the Mellotron with such dexterity that we travel between the grave dark tones of organ to those soft fluty melodies. Towards the half-time, the noise of rails gets us out from our celestial torpor to breathe life into a brief and heavy sequenced movement which hems nearby a Mellotron creator of melodiously fluty musicalities. It's a brief passage, and a very TD one, which dies out in the immense Mellotron strata which cover "Epsilon in Malaysian Pale". "Maroubra Bay" brings us closer to the soils of Tangerine Dream. A terrifying wave is springing out from an abyssal nothingness to set ablaze an apocalyptic and symphonic synth. It's a heavy and black intro which slowly draws a beautiful sequenced movement. A sequence which waves with suppleness among wandering strata which glance through a structure became melodious, crumbled regularly by breezes and waves of a Shangri-La. This is a splendid fusion of the elements of water and winds which enriches "Maroubra Bay" and which maintains its undulating road in a heterogeneous universe which fits easily to a very wrapping Mellotron. “Epsilon in Malaysian Pale” is a small jewel. A true masterpiece which explains why Froese was considered for a long time as the soul of Tangerine Dream. It's an album which could have been able to make the repertoire of the Dream so much it sounds and feels like a TD's one. An inescapable in contemporary EM and a way to discover the wonderful musicality of the Mellotron. Contrary to the remixed version of Aqua, which came after this one, this second life of “Epsilon in Malaysian Pale” comes with nearly the same artwork, with brighter colors, and no bonus track. But there is a whole sound difference. First of all, the intro and finale of the title-track are longer. But this adds nothing very new, because that the tone is more metallic and that the shouts of animals are replaced by some metal ones that we twist with mockery. The musical structure? Bof, it's nearly the same, except that the Mellotron is digital. So, it's a colder tone compared to the original. A tone which is the equivalent of the digital era and which gobbled up all of the subtlety of the analog equipments of the former days. A cold and lifeless sound. Thus this remix brings nothing new. I won't dare to write that it's a pale reflection because we are talking here about a major work. And frankly if I had not listened to the original I would say that it is completely brilliant. So there is no witch-hunt to be made … But it's might be the price that Edgar, and his fans by ricochet, has to pay to get back the rights of his catalog. Nevertheless, if you still don't have “Epsilon in Malaysian Pale”, it's a necessity to get it. This version, to encourage Edgar, or the original one. Even without the warm emotivity of the original it remains a wonderful album remixed by a lazy person. I do believe that Edgar had amply the chance and the time to remodel his masterpiece. If the grey fox had an ounce of respect for his fans and his works he would have updated it, while working with his old equipment, and enhanced it, in the same way that Jean Michel Jarre did with Oxygene. And there he could have gone for more improvisation, stretching out the music because the situation lent itself to it admirably well. And don't get me wrong; I love Edgar. It's just that I think that Edgar doesn't do as much as his fans are doing for him. But Edgar... Sometimes he is so difficult, so unseizable. Well, I had to let it out! Keep in mind that what we have here is a true masterpiece and that if you still don't own, it go get it. Try the original version, if not this one is ok too but you will missed the true essence of the analog perfumes of the Mellotron. And the Mellotron here is the most wonderful and musical that you will hear. We hear jingles trimming the wan synth layers which open "Setting Forth". Sinuous, and very translucent, the layers of synths and the breaths of gargoyles counter-attack the weight of the percussions which increase the crescendo without kindling the rhythm. And there, there are percussions which breathe. Like the pulsations of an alien, these percussions complete the impressive meshing of the kegs and skins that forge Steve Roach and Byron Metcalf. The power of the music! Welcome in the surrealist universe of “Tales from the Ultra Tribe”. A universe where the acoustic skins compete with those electronics under a musical sky darkened by some layers in colors that only Steve Roach can imagine. “Tales from the Ultra Tribe” is the 2nd collaboration between Roach and Metcalf, the other one being The Serpent's Lair in 2000, and it's an album as surprising as refreshing where the music feeds on the sounds of two architects to the antipodes gathered under the fires of the esotericism. Having reached its cruising speed, the rhythm of "Setting Forth" lives on these sucker kind of pulsations where is hanging a heap of percussions which bubble up with its tones as diverse as heterogeneous. 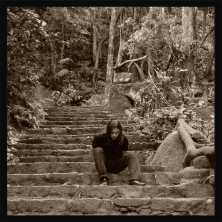 Steve Roach frees his winds which blow such as scraped breezes on an earth to anfractuous reliefs. That's exhilarating and our ears are eagerly waiting of the slightest suspicion of distraction, the slightest detail which whips up both hemispheres. And there are. It's the strength of “Tales from the Ultra Tribe”; combine ambiances and rhythms of shaman trance without ever gone off the rails in the emptiness, in the abstract of passive atmospheres. Certainly there are soft rhythms and ethereal ambiences ("Fire Sky Portal" and "In the Safety of Travel"). But I would say more that these are soft atmospheres, because the percussions liven up constantly the fire of our interest. With its floating, but melodiously soporific, synth layers, "A Noble Direction" fights against the lunar sweetnesses of Roach. The rhythm is constantly fattened by the strikings of Metcalf in this fascinating fight between the synthetism of the keyboards and the acoustics of the percussions of which the echoes breathe steel. And we move forward from delights to delights with these 8 tracks which stick in a mosaic of 74 minutes. After the passive rhythm of "A Noble Direction", "Midnight Migration" melts in the ear like a kind of groove for zombies. A track which is going to please to the fans of Klaus Schulze, "Midnight Migration" waves under the winds of oracles, the shamanic gurgling and the serpentines of synths which scribble a dark atmosphere. The percussions are magnetic and their surgical strikes attract the awakening towards spiritual trances where shoulders roll but feet remain anchored well in our cerebral hypnotism. And it's one of the uncountable charms of “Tales from the Ultra Tribe”; the duality between synths sculptors of sleep and the percussions smiths of trance, as in the very wrapping "The Magma Clan" where the breaths of spectres have no influence on the alive percussions of Metclaf. With its wild rhythm, "Road from Here" brings us on the other side of “Tales from the Ultra Tribe” where we run after our breath under the loops of the lassoes which blow above our heads. The rhythm is delirious and rolls on percussions; one would say tens of hands which knock in accord, whose strikings multiply ceaselessly under the aegis of a synth and of its elfic harmonies. The heart doesn't follow the storm and takes refuge beneath enveloping and soothing strata that a synth releases at around the 6th minute, waking the anger of the tom-toms gods who roll their kegs, the sound avenging. The finale kisses some aftermaths of "Setting Forth" while we stumble into the very ambiospherical "Fire Sky Portal" and of its organic fauna, there where live beings that only the imagination can create. This fauna dissolves into the alive percussions of "Return of the dragon Bone Tribe" of which the title embellishes with images marvellously its contents. The rhythm is ambient and the ambiences are organic. The percussions breathe of a life of stridulation, mixing the clanic percussions with the noises of the swamps of deserts. And we let ourselves being charmed by this absent rhythm which breathes, while that quietly we are invaded by the soothing of "In the Safety of Travel". Percussions, percussions and percussions! The universe of “Tales from the Ultra Tribe” sits above those. You have to see the list of percussions and of their adjoining noises that Metcalf and Roach are firing with a disconcerting dexterity. And these percussions breathe of a strange life of parallel rhythms where the contradictions are attracted in the shade of synths which remind us constantly the universes of Dreamtime Return, Proof Positive or still Fever Dreams. 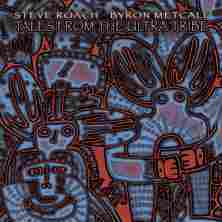 A beautiful album from Steve Roach and Byron Metcalf which will know how to bewitch you for sure. Ah Ian Boddy... When we talk about EM we forget too easily his name. And nevertheless if there is an artist who doesn't stop to surprise, from album to album, and this no matter the kind, it's got to be Ian Boddy for sure. Drawn from the recordings of concerts given at the antipodes of the planet, Philadelphia and Liverpool, “Liverdelphia” is a powerful work. A work where the musical duality spreads its veil of magnetism and where the listener is swallowed to be teleported in a sound universe to the measure of the immoderation of an artist to the visions as infinite as the musical meanders of his synths cables. A work where the cosmos of the vintages years is skilfully rediscovered, a work where the atmospheres get revitalize in rhythms as hard than pure, “Liverdelphia” will nail you in your dreams with a surprising dominance on your fascination. Winds, of any forms and of all colors, which blow among electronic chirpings are quietly chased away by a series of twinkling arpeggios. These sequences, which skip shyly from the tip of their chords, forge a clumsy rhythm which limps under the grave octaves of the chthonian choirs. The ambience becomes of mist, while that "Open Door" hears its chords of rhythm ringing out with more vivacity under the sinuous curves of solos in the soft analog perfume. Solos of synth which float lazily on a rhythm became soft that a bass line harmonizes with some metallic jingles, whereas calmly "Open Door" sinks into the gaps of an electronic ambiospherical universe where twisted reverberations and dialect of the machines prowl in the cosmos while waiting for the soft circular rhythm of "Crystal Light". Like a carousel of magnetism, "Crystal Light" offers a superb structure of tranquillity with its glass arpeggios which swirl like the horses of woods in the old merry-go-rounds of our childhood memories. The rhythm is ambient. It revolves with a morphic slowness in beautiful sequenced volutes, while the rippling mist is switching shape into some fine poetic solos, allying magic, fancy and virginality in a long waltz slow and floating where the crystal sings its lunar lullaby. It's very beautiful. These fragmented singings get lost in the very ambient "Driftwood" and of its symphony of solos singers which cry in a cosmos disrupted by oblong dying reverberations and by scattered astral gong sounds. The ambient world of Boddy is pretty unique. It's rich in composite sound elements which always manage to create a fascinating symbiosis where the slightest wind, the slightest beating stigmatize a sound wealth in perpetual mutation. We dream, we float in "Driftwood" which serenely brings us towards the piece of resistance: "Triptastique". We are in full heart of a pulsations storm which forges the bases of percussions drummed in the winds of ether. Even static, the rhythm is exhilarating. It pounds on the spot, lazy that it is to make caress its whimsical jumps by the vapors of the ionosphere, by orchestral sighs. One would imagine being at the heart of the genesis of Jean Michel Jarre's Oxygene. And the solos arrive. Tinted of ambivalent tones, they overhang this long track of long twisted breaths. Curly breaths which shout on a rhythm which becomes more intense and whose chaotic fluidity marries that of solos before becoming blurred in a peace of mind drummed by some pulsations forgotten on the path of space. And so closes the first act of “Liverdelphia”. The concert of Liverpool opens with the vampiric veils of "Overture". Slow strata are wrapping us, as the night switches off the day, in a dark and bewitching atmosphere. It's a track where Arc stumbles over Redshift in a slow movement where the synth layers inhale of a black life among scattered explosions and chthonian choirs. Intense and puzzling, "Overture" does all its effect in a black night out of electricity. "The Long Road" is drinking from the finale of "Overture" with hoarse winds and guttural reverberations which intertwine and fade into abstract bangings and shamanic shouffs, while the first furtive chords are trading the bass pulsations against resonances of glass. And "The Long Road" to spread its slow structure of cosmic groove. The luminous chords are sliding under the influence of cosmic gases, while the cymbals flutter about of their silky jingles and the slippery solos are dancing on a structure in perpetual bickering between its light rattling rhythm and its erratic cosmic cha-cha. This uncertain rhythm kisses a steadier pace, making war to ambitious solos which swirl ceaselessly over the false dance steps of a dance without precise schema of which the drummed steps get lost in a line of crystalline arpeggios which tint in the echo of its harmonies. This is some great Boddy we have here! After the very ambient and very wrapping "Never Reaching" and its huge vampiric veils which blend in beautiful orchestral arrangements, "Destination Zero" offers a breakneck pace which sits on violent spasmodic oscillations. Percussions and bangings feed this starving rhythm which runs with ferocity beneath the solos of a synth among which the melodious presence and the oniric mists spread a bit of sweetness on this oscillatory storm. Here is a powerful track which knows a little short quiet passage before being reborn of its unchained oscillations. And "Coda" ends a concert amazing of violence and of tenderness with the same imprint of mysticism as "Overture". “Liverdelphia” is brilliant album where the universe of EM gets cover of its warmest tones in a superb progressive shroud. Ian Boddy surpasses himself with pre-Jarre cosmic ambiences and rhythms of which the surprising variations stabilize this fragile harmony between the ambient world and the universe of sequences fed by thousand arrhythmic pulsations. There is not one single minute of lost on this splendid album where all the colors of EM are used to give a sound picture of a fascinating hearing beauty. An album as wonderful as the borders of the art itself. Make something new out of old! Is it possible? Yes and especially with the last state-of-the-art technique remastering: the DQC System. But this won't change the settings because “Aqua 2005” has nothing to do with its 1st version 30 years earlier. Starting with the artwork, Edgar brought numerous changes, in particular on the rhythmic structures, leaving in obscurity the dark and psychedelic side of his initial work. First of all, the title-track! The water sound wealth is colder, more digital and undulates on soft percussions of a typist style and a light sequencer in procession mode which lives in a universe which is less rich in sound effects, less diversified. Thus, "Aqua" gives birth to a new life. A rather interesting one, but very far from its first subtleties. "Panorphelia" keeps its mysterious aura and the nervous drive of its first days, except that it's wrapped by Mellotron strata, soft and melodious, and by some short sequenced fragments. An alter à la Tangent Box but with more mordant. If the first 2 tracks remain all in all interesting, "NGC 891" lost a lot of its lustre on this 2005 version of Aqua. Is it because of the dispute surrounding Froese. and Franke? The fact remains that the track is amputated by more than 4 minutes, besides having an annoying "glitch" towards the 2:30 spot. The heat and the subtlety of the 1st version give way to a digital coolness and to an emotive placidity that we perceive very annoying. Having said that, "NGC 891" stays a very interesting track which didn't need to be dress again by Edgar's strata to give it more luster. "Upland" has kept the spirit of its first draft, whereas "Upland Down" is really a remix which leans on the original structure. Good percussions, beautiful synths and a sweet melodious approach which sounds like something we heard somewhere. But with all that Edgar simmers, a cat would lose its small kitties there!!! In conclusion, “Aqua 2005” is not that bad. If the ambient phases are not on your EM menu, go for this one without hesitation. But on the other hand, I eventually succumbed to the latent charms of the 1st Aqua. Charms which are absents on this 2005 version. And remember that at this time, I wasn't a lover of ambient EM. 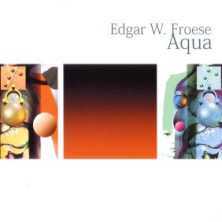 It's through a damn flu filled with a Neanderthal virus that I undertook a series of reviews (March 2009) about the solo works of one of the most important figure in contemporary EM and founder of Tangerine Dream; Edgar W. Froese. And credit where credit's due, I begin with the very enigmatic “Aqua”. Abstracted musical universe and rich sound structures, here what depicts quite well the impression which leaves this first solitary effort from Edgar Froese. 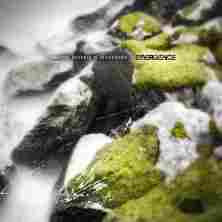 The icy blue of the artwork with a brightness of ice, more coordinated than the musical art itself, announces an album very Berlin for this progressive electronic period where the music is in hiding behind innovative ideas which are the privilege of the solitary creators of a Berlin scene which tries to surpass the British invasion of progressive music. That's where bloomed so many interesting names like Schulze, Gottsching, Schneider, Fricke and Edgar. This dear Edgar who will become one of the most interesting character in contemporary EM. I remember my first contacts with the cold and very hermetic world of the title-track. I discover the music of TD on the late with albums like Tangram, Thief and White Eagle. We are in 1984 and Risky Business works pretty good here with the performance Rebecca De Mornay and her sweet little face. I hardly digested Phaedra (which I will consider as a master piece a few years of Black Metal later) that my friend decides to make me swallow “Aqua”. Oh...that the first gulps were in lack of thirst. But docilely, my ears get formed to the wonderful universe of the minimalist music (Mike Oldfield and Tubular Bells), prog and folk (Genesis and Selling England by the Pound or the brilliant Ghost by The Strawbs) and progressive electronic music in cleanly spoken, Jarre and his Oxygene in 1976, Vangelis and Spiral in 1977 and Synergy's Cords also in 1977. It's a little through this mishmash of sounds and noises that I finished to pierce the mysterious beauty of EM and the world of Tangerine Dream. I know, it's a long prelude to speak about “Aqua”. But one doesn't love “Aqua” who wants or who would like to. Because “Aqua” was a bit outside the boundaries and pushed even farther the limits of the auditive explorations. 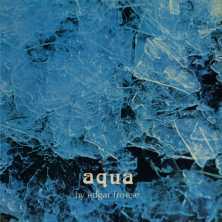 Recorded inside Froese's apartment with a homemade technology, which consisted in getting diverse sound sources from earphones installed on the ears of a model, "Aqua" begins in a water sonic fauna with fine rhythmic modulations which survive in a stagnant swamp and where sound planktons merge with the abyssal beauty of a terminal phase. There is something there to close our eyes and dream. To imagine this perplex and atonal ode with some great green smoke coming out of a big joint. Some strings of sound effects follow one another in a pond with undulations create by knocks of reams or by pure whim of a poet without verses. This is a strange music, in a strange universe which continues with "Panorphelia" and its sequential structure pulsing on a beautiful wandering Mellotron. And the Mellotron on “Aqua” is quite exquisite. It's the cornerstone of this album. Hypnotic, soft but heavy "Panorphelia" kisses the frontiers of Mysterious Semblance at the Strand of Nightmares. With "NGC 891" we plunge back in the underground universe of sound effects where the rural traffic is melt into the noises of jet planes on an intro which is late to adopt the superb imposing presence of Franke on the big Moog Modular. This is an excellent track which grows with efficiency and which has to nothing envy to Pink Floyd's On the Run, although less violent but strangely more elaborate. As for me, it's Edgar's first power rhythmic track. "Upland" ends with big circular organ which captures all sound forms of energy, a little bit like a hurricane chaser. I like this fusion of ecclesiastical organ in a context of sound modernity. Very experimental, but not really musical, "Upland" depicts marvellously “Aqua” and the complexity of sound researches from Mr. Froese. “Aqua” isn't really a melodious or/and harmonious album. It's a work of creation which has opened many doors to the sound exploration and to the parameters of fusion between the abstract and the harmony, for a more musical creativity in the years which followed this strange album. I eventually ended to find it kind of nice. It's a form of communication between the abstract and the perceptive beauty of an author in the creative and audacious imagination. And you know what? I ended up by liking this sound universe which is “Aqua”. Begin with "NGC 891", "Upland", "Panorphelia" and "Aqua". You will understand why it took me some time to finally enjoy this first solo work of dear Uncle Edgar. And if you can put your hands on the first version from Virgin, grab it. Avoid at possible the tangentized version that Edgar released over the last years. Although the Virgin Years seems quite good. "A Deeper Shade of Sleep" starts this Richard Bone's new musical adventure on AD Music with a concerto for angelic voices. Chords in to tones of harpsichord or of baroque guitars waddle in the harmonious furrows of those choruses, drawing two lines of parallel harmonies which melt in the ear with a surprising musical poetry. While the voices begin to hum, percussions are flavouring the absent rhythm. The soft strikings give to the track a form of cerebral trance that layers of synth caress of their vampiric veils. And "A Deeper Shade of Sleep" drinks of fanciful sitar, plunging slowly into a phase of electronic rock skilfully manipulated by a meshing of percussions, as much handily as by drum sticks, and sequences which shake a rhythm trapped in its astral waves. Down from its 6 minutes, "A Deeper Shade of Sleep" is the reflection of “Images from a Parallel World”. Like a musical anaconda, the music of the Richard Bone's last opus changes of skins, allying eclecticism and melody in structures which maintain alive their embryonic forms. If at the beginning we get lost in this strange electronic folklore, we are rather easily seduced by this carousel of harmonies which turns constantly on structures as much hard to seize than a snake. If there are a few simplistic tracks, I think in particular of "Eucalyptico", "Lithographic Lines Love" and "Of Flowers and Fools" with light rhythms full of drive, synths with catchy harmonies and nice orchestrations, the rest is my faith as convincing than impressive with a pleiad of tracks which deserve a more ample investigation of the hearing. "Dadaelia" is a beautiful ambient track where the ends of chords are splitting up into multiple shimmering mirrors fragments which twinkle and resound in a space as dark as the pulsations of a bass line of, drawing so the slow agony of 6 great minutes of ambient music. "Trans Mutual Sunshine" pours its sorrow into the morphic ashes of "Dadaelia" before mutating into a beautiful lunar down-tempo where the chords of glasses, and their shadows, forge the shroud of a beautiful ballad for agitated nights. More fragile, "Cathedral Spires" is a very good lunar melody which hangs on to a meshing of drummed percussions. "System Wide Slumber" is a great monument of ambience which caresses juvenile dreams. The synth strata are smooth and float with such a weightlessness that it nails us in our waking dreams. And the seraphic choruses… Oh this is so beautiful. "Simple Sirius" is a sweet melody brightened up by some percussions sounding like xylophone hits which give a freshness of the Caribbean Islands to this track which could have been a great one for a documentary about penguins. It's a little bit like "Eucalyptico", except that there is a little something that hooks the hearing. "Eight Sufis Swinging" is a macabre procession which changes finely its skin before falling in a kind of a rather suggestive blues. That's the kind of track that we don't expect, that we don't see coming, in particular with some brilliant Arabian orchestrations, and which eventually charm, otherwise disturb. The same goes for "Lavacicles" whose intro is also sinister but of which the evolution amazes with its rhythms and its harmonies which follow the contiguity of the intro. "Atma Is" surprises us with its approach of organic hip-hop, demonstrating so all the eclecticism and Richard Bone's versatility on “Images from a Parallel World”. You remember Michael Stearns' Plunge? It's a little to what makes me think “Images from a Parallel World”. It's an album of a stunning diversity where all the facets of EM are visited, except those of Berlin School style. We find some synth-pop, down-tempo, black and cosmic ambiences mounting of beautiful lunar harmonies. This is a beautiful album with some nice pearls that fans of Berlin School will unfortunately have to let it pass...unless that, like me, other kind of good EM doesn't bother you at all. Make relive the disused buildings. Make speak these ruins by the breaths of their ghosts of time who are the silent witnesses of the joys, the sorrows, births and deaths, the murders, the violence and of the forgetting. The ruins are the vestiges of our civilization. And those more modern will be in the centenaries if the avidity for new buildings won't erode the landscape of desolation which upholsters these ornaments deserted for a call to a better life. For his last album, René Splinter has decided to make speak the bones of civilizations destroyed by the wars or abandoned by their occupants to occupy the ruins of tomorrow. A strange project where the pitfalls are in every corner when we know the very melodious style of the Dutch synthesist. And no, the universe of René Splinter hasn't change at all. Alone behind his keyboards, he always likes to imagine what Tangerine Dream would have become with him. And the result of his fantasies is always so delicious, even if quietly René Splinter begins to look like Johannes Schmoelling. “Modern Ruines” is his 4th album and his 2nd on Groove. It's an album which offers another vision of Splinter with many more atmospheres than on his previous works. But don't worry, the rhythms built on sequences and on their echoes in the shape of cascades and the catchy melodies are always there, unique to the musical signature of Splinter. Only, the man decided to be more audacious, like a certain Johannes Schmoelling. Nostalgic chords ring with the transparency of glass in the winds which whistle through the urban pyramids. Shy of its multi phased rhythms, "Urbex" hears the rustles in the rain and the resounding circles which float of their deformed outlines before shaking its awkwardness with the strikings of scattered percussions. Strikings which resound as knocks of anvils and shape a slow rhythm. Chords fall in series of cascades, forming the structure of a finely jerked rhythm which hiccups under the breaths of a very Jarre synth. And "Urbex" spreads its structure of rhythm. A structure where sequences skip in a collective neurosis, jostling their echoes in order to forge a nervous rhythm, as we are going to find on the powerful "Pod City", "Footprints in the Dust" and "The Pendulum". It's a rhythm where the percussions are astride over bed of sequences which glitter as waves of harmonies in a structure which plunges us in the years Virgin of the Dream and those of a Jarre more synth pop than cosmic. We can't love "Pod City". The intro is from atmospheres out of Exit with these opaline mists which float as threats of ether, unfolding some morphic veils under the gurglings of electronic voices which answer such as some percussions in oblivion. A superb line of sequences escapes from there and makes dance its keys in a symphony of shifted rhythms which roll like a series of cascades. The percussions fall and hammer a blazing rhythm while that layers of sequences are radiating of gleaming effects, guiding "Pod City" through its permutations in rhythms and its harmonies which run and get their breath back in a surprising anarchy. These two tracks are bombs of which the aura will have some difficulty to survive to the minutes which follow. After a rather atmospheric track in "Scenic Reels" where the carillons are ringing in a life turned upside down by waves of streetcars noises, "Footprints in the Dust" presents another structure of multi phased rhythms. At first quite soft, the rhythm sparkles of its glass sequences. Sequences in cascades of which the very recognizable pattern of Splinter's harmonious rhythms cavort there, forging a rhythm which marries the shape of a movement of rhythmic canon. Chords of a melancholic keyboard draw a melody all beautiful in its Schmoelling dress while the percussions come to hammer this rhythm which becomes so heavy, even jerky by moments of a technoïd approach, while the shrill synth solos tear of their sharp wings. Let's say that it's the good track which is inspired by "Urbex" and "Pod City" without having their depth. A track suspension with a crowd of disruptive sound elements, "Regeneration" stays of vapor in its approach of metallic cloudiness. We find in here so many sonic elements that Tangerine Dream exploited in the years Exit. Here and on the quiet rhythm of the title-track, even if a bed of sequences wriggles there, of which the structure of subdivided harmonies reminds me constantly of Yanni's first albums and of Johannes Schmoelling. "Nostalgia" wears marvellously the weight of its title with a superb and delicate piano which sings its melancholy in dusts of carillons and the iridescent breaths which quiver with nostalgia. It's also beautiful as the title itself. "The Pendulum" concludes “Modern Ruines” with a crazy rhythm. Agitated sequences, of which the alternative strikings are shaping rollers of ball which hiccup like being on a wild conveyor, build a complex rhythm which spits its moderated explosions in a disorder which inhales a surprising rhythmic coordination. The waves of big synth pads spread the pieces of a Dantesque melodious approach which cannot get through these crazy sequences, alienating and splitting both the rhythm and the melody which get lost in the mazes extremely unbalanced of a pendulum hung in the storm. 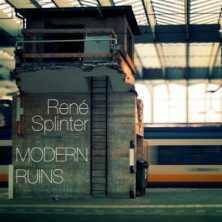 What a way to end this other very good album from René Splinter! “Modern Ruines” is an album that will please to René's fans and also to those who feel at ease with energetic electronic rhythms where the rock and synth-pop are merging with an incredible violence while catching constantly the roots of New Berlin School. If you enjoyed the Virgin years of Tangerine Dream, it will also fit your needs. I like that Splinter goes out of his comfort zone and that he dares to go exploring some atmospheric phases where the emptiness finds a sense. That gives depth to these constant evolutionary phases of rhythms. And from Jean Michel Jarre to Tangerine Dream while passing by the strong recollections of Johannes Schmoelling's harmonious world, “Modern Ruines” inhales the duality between these indomitable rhythms, of which the movements of harmonious cascades push away even more the paths of the sequenced boldnesses drawn by Chris Franke, and these atmospheres of deaths forgotten in the vestiges of the contemporary ruins. In the firmament of independent artists who produce some very good music, a well made and well mixed music, you should not forget Gustavo Jobim's name who can give a lecture to so many artists who emerge on well know labels. “Manifesto” is his 11th opus. Divided into 2 parts, like a double album, with 7 tracks for each part, “Manifesto” is inspired by the life of two artists who had an influence on the artistic vision of the Brazilian synthman; the Swiss painter H.R.Giger, to whom we owe the ET-monster of Alien, and the Brazilian poet Augusto Dos Anjos. It's an intense work. Difficult to tame but splendidly put in music, where the madness is hide behind every second. An album mainly of ambiences. Dark, intriguing and anguishing ambiences where the phases of rhythm unfold to lose breathe on lines of synth to tones of Synergy and old organs of darkness. "The Disquieting Muses" opens the ball of insanity with a synth line crushed by choirs to the chthonian hummings. And such as a plasmatic merycism, this synth line subdivides its fears with ghostly tones of old organ which float among these voices became composite where the opaline tints get muddled up to more ethereal breaths in an intro as so ambient as dark. We would run against death that it would be as in "Biomekanik". The rhythm is delirious and engenders chaos with a meshing of sequences, pulsations and wooden percussions which runs to lose breath under the laments of a vampiric organ and of a synth which moves closer to the surreal atmospheres of the Cords album from Synergy. Intense and hard-hitting, that destabilizes the hearing. Brilliant! "The Spell" brings us back in the universe all in contrast of “Manifesto” with a long ambient phase which breathes on an oceanic background music where we hear the bubbles of oxygen gurgle through an entanglement of lines to the sibylline tones which quietly permute into some organ tones of an occult cathedral. I would run against madness that it would be like in "Origin of Obsessions". After some sound waves which tear the blackness of their anfractuous blades, the rhythm settles down. Black and heavy, it pounds of its stormy oscillations to flee an avalanche of synth lines of which the quirky and shrill tones condemn the madness as being the last rest. After its thunderous call to madness, "We Atomic Children" establishes a climate of discomfort with its black pulsatory lines which float and interlace on a Mephistophelian dialect. "The Mystery of San Gottardo" suggests a tormented melody with a piano, at first glance rather melodious, which isolates itself in an alienating zone. "At the Bottom of the Shaft" encloses the first part of “Manifesto” with a long phase of dark ambiences which flows through a synth and of its grave, droning lines and delicate fluty bouquets. "Hallucination by the Seashore" begins the 2nd part with a structure of rhythm which makes jump its keys shapers of rebel rhythms in a fascinating symphony for steps lost in oblivion. The rhythm is bubbling in its static approach, knocking off a melody which seeks for support over the delicate and very discreet synth lines. "Living in the Light of the Immortal Worlds" is a long ambient passage where synth lines squeak in unison into some enveloping chthonian choruses. Not more given rhythm, but livened up of undulating synth layers to tones of old organ, "The Eleventh Hour" throws its waves of agony which roll in the ear like a caress on the back of a penniless. It's as much intense as deeply moving, even if very black. The piano of Satie can be as beautiful as violent and tormented, Gustavo Jobim shows it on "Appearance of the Ghost of Erik Satie" which offers a very beautiful 2nd portion before make jostle its notes in "The Flock of Birds" which adopts effectively the social life of a flock of bird with their innocences and their fears. And then the piano becomes source of madness on "Iconoclast's Despair" which wears marvellously the sense of its title. "Eternal Sorrow" is ending “Manifesto” in two parts. If the first one is intense of its black and morphic synth veils, the 2nd plunges us into the cave of a dishevelled structure which honors the black, sibylline and convoluted ambiences which overhang an album where both inspirations of Jobim feed on a vision of torment, even of anxiety. “Manifesto” is not for all ears. It's an album where the beauty hides in its approach of oddity, and sometimes iconoclastic, insanity. But the atmospheres are enveloping. Very enveloping. And the music is breathing of these adventurous synths that Larry Fast tortured in his first Synergy albums. I like. It's like reading an old story Edgar Allan Poe on the end of your buttocks so much we are on the edge.